Have you ever heard of this dish? In Persian, it literally means “layered at bottom (of pan)”. It basically consists of layers of saffron rice, with beautiful marinated chicken. It smells amazing, looks beautiful and it has a crunchy crust on the outside. So, if you make it in a circular Pyrex bowl like i did, it looks like a cake! I’ve loved this dish since I was very little. It’s always so popular in Persian dinner parties and it’s one of the more challenging dishes of the Persian cuisine. The reason for that is usually only the best and most experienced cooks can flip the pan and bring out the rice with the crust in one piece, without cracking or sticking to the bottom of the pan! Now, I’m not that experienced of a cook at all! So I have to give big credits to the person who wrote this recipe in the first place and that is Sanam of mypersiankitchen.com. Usually, this dish is made in a big non-stick pan on stove top, and left on low/medium heat until the beautiful crust is formed. But, all my labs are stainless steel unfortunately. So I was very happy to find Sanam’s recipe, which taught me it’s also possible to make it in the oven! It’s takes a bit longer, but its so much worth it! This crunchy crust is a staple of Persian rice dishes. It’s called “tah-deeg”,meaning “bottom of pan”. Another dish with tahdig is this one, with broad beans, dill, and saffron of course! Also, I will put up step by step pictures soon. 1. Halve the onion and garlic and place them in a pot with the chicken and bay leaves. 2. Pour enough water in the pot to cover the chicken completely. 3. Bring to boil and cook until the chicken is completely cooked through ( You can cut the chicken slightly to make sure it’s cooked inside too). 4. Take the chicken out of the pot and leave to cool completely. Discard the rest of the elements in the pot. 5.Make the marinade by combing the yoghurt, brewed saffron, egg yolks, salt and pepper. 6. Shred the chicken with two forks, place in a bowl, and pour over the marinade. Make sure the dish is the right size so that all of the chicken pieces are covered completely in the marinade. 7. Leave the marinade in the fridge overnight. 8. The next day, put rice and water in a pan and bring to boil. 9. Test the rice grain every 1 minute or so. You should not let it become soft at all. Remove from heat when it is “al dente”, meaning it has a bite to it. 10. Drain the rice using a colander and pour cold water on it. Set aside. 11. Take the marinade out of the fridge. Remove the chicken pieces from the marinade. Try your best to separate chicken pieces from the liquid marinade as much as possible ( the marinade would be a bit thick). 12. Pour the rice in the marinade and stir to combine. 13. Preheat the oven to 180 C.
14. Take a medium size Pyrex dish and grease it with olive oil. 15. Begin layering by putting a rice layer with a thickness equal to 1/3 of the height of the dish. 16. Arrange as much chicken pieces on top of the rice layer as you can. This depends on the diameter/width of your dish. 17. Place another rice layer. 18. Repeat the two steps above, until all your rice and chicken has finished. Finish with a rice layer. 19. Cover the dish with foil and place it in the oven for 3 hours. 20. You know it’s done, when you see a nice golden brown crust around the edges of the dish. 21. Place a flat serving dish over the top of your Pyrex dish and flip. The rice “cake” should come out easily in one piece. Note 2: How to brew Saffron: Look here. Posted in Persian, RiceTagged chicken, rice, saffron, tah-cheen, tah-chin, tahcheen, tahchinBookmark the permalink. You’ve done very well. 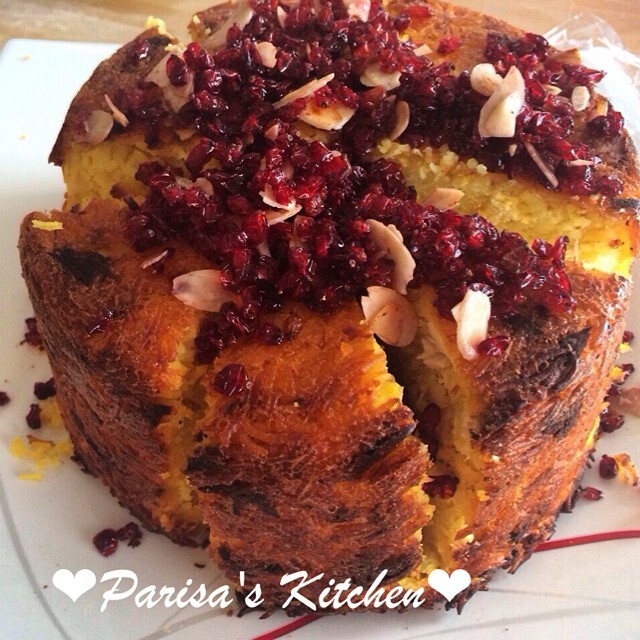 I am sure it is mouthwatering.You can improve its presentation with barberries and thin diced almond and pastatue. They can make the appearance more colourful. This looks amazing. I have never seen anything like this. I should give it a go sometime. Thanks so much for sharing. Have a great week! I love it and I want to learn how to make it. Does it taste nice? I think it tastes very nice. Thanks for stopping by my blog again!! !